Open net stitches are frequently used to crochet lovely designed shawl, wraps and dollies. However, if you are making a shawl or any item that requires increasing then you will needs to know how to increase in patterns that use an open net stitch. 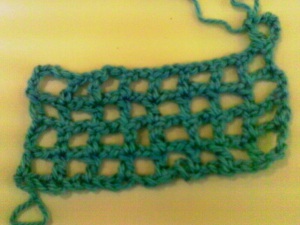 Work sample piece of 4 rows of open net stitch. 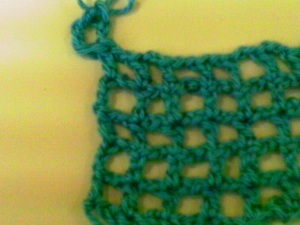 Crochet multiples of 3 chains (chs) for a foundation or base row. For example, 3 x 8 will give you a total number of 24 stitches for your sample piece. Skip your first dc and work a dc in the next dc * chain 2, work a dc in the next dc* repeat from * to * across ending with a dc in the 3rd chain, chain 5 and turn your work. Row 2 completed. Chain 5, turn at the end of the last row of your sample piece. Make a dc in the first dc of the last row. This makes one open space or one increase space (inc). Continue across to complete row working open net stitch. If an increase is needed at the opposite ends of your row then repeat the increase in the same manner. Chain 5 at the end of row to start the first open space, then chains 6 more for a total of 11. The chain 6 will allow you to make two extra open spaces or squares, at the end of a row space 2 and 3. Work a dc in the 6th chain from your crochet hook, chain 2 then skip 2 chains. Dc in the next chain, chain 2, skips the next 2 chains then dc in the first dc of the last row. Chain-5 at the end of your sample piece and make a double treble crochet (dtr) in the same place as the last worked double crochet. Chain 5 and turn your sample piece work a usual across the row.